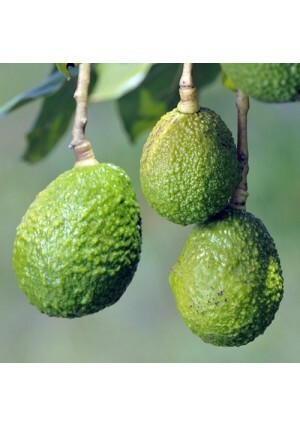 The Hass Avocado is a Type "A" avocado, which means it is self-fertile. The tree produces a fruit with a pebbly, dark green colored skin. The fruit has a delicious, buttery nut taste. The tree reaches a height of 15-20 feet when planted outside. As a container grown tree, the Hass Avocado will mature to a height of 5 -7 feet. The Avocado tree is cold hardy in USDA Planting Zones 9-11 only. It can be kept as a container-grown tree in other USDA growing zones if it is brought indoors for the winter. Avocados don't just taste amazing; they are also an excellent source of many different nutrients. Rich in monounsaturated fatty acids, avocados also contain a number of vitamins, including K, E, C and B6, Niacin, beta-carotene and many more valuable additions to a healthy diet. A versatile and tasty cooking ingredient, the avocados you grow can be used in salads, dips, wraps, as a spread on toast or in sandwiches or as an ingredient in anything from tacos to soup! Once your avocado tree arrives, you will need to transplant it into a suitable container; unglazed terra cotta can work well. If your climate is too harsh for the plant to survive outdoors, it's important to make sure that the pot is located in a sunny position – avocados need plenty of light if they are to thrive and not become “leggy.” Particularly in the early days, your avocado tree will need generous watering until it becomes established. This is to help the root system develop and become established. Once the tree is older, it won't require a much watering. Periodically you will need to feed your avocado tree in order to keep it in peak condition.